It's never too early to plan classes. It is important that exchange students take classes that are both beneficial to their academic goals and also appropriate to their academic situation. Learn more about which classes they can or cannot take, where to look up available classes, and common issues exchange students face when enrolling. Non-degree exchange students are required to be enrolled full time for the duration of their studies at the University of Oklahoma. For all exchange students, minimum full-time enrollment is 12 credits, and maximum full-time enrollment is 15 credits. Typically this is 4-5 courses per semester, as most OU courses are worth 3 credits. Most courses taught on the Norman campus are open to exchange students. Exchange students are permitted to enroll in courses outside of their primary field of study if they show appropriate background knowledge and coursework in the subject area. *Exchange students can take Law courses only if they are law-degree students at their home institutions and meet the English proficiency requirements. Some colleges must approve all course requests before enrollment: Architecture, Business, Earth and Energy, Education, Engineering, and Journalism. All Department of English courses, other than English for Exchange Students, require a graduate-level English proficiency score. Architecture students must submit a portfolio prior to enrollment. All courses in Economics require a math placement test online or upon arrival. All graduate coursework, for undergraduate or graduate students, must be individually requested through the Exchange Student Coordinator, and students must meet the higher English proficiency requirements. If enrolled in graduate-level courses, exchange students will receive undergraduate credit. They may NOT earn graduate credit for graduate-level courses, and they may NOT later apply these credits to a graduate degree at the University of Oklahoma. 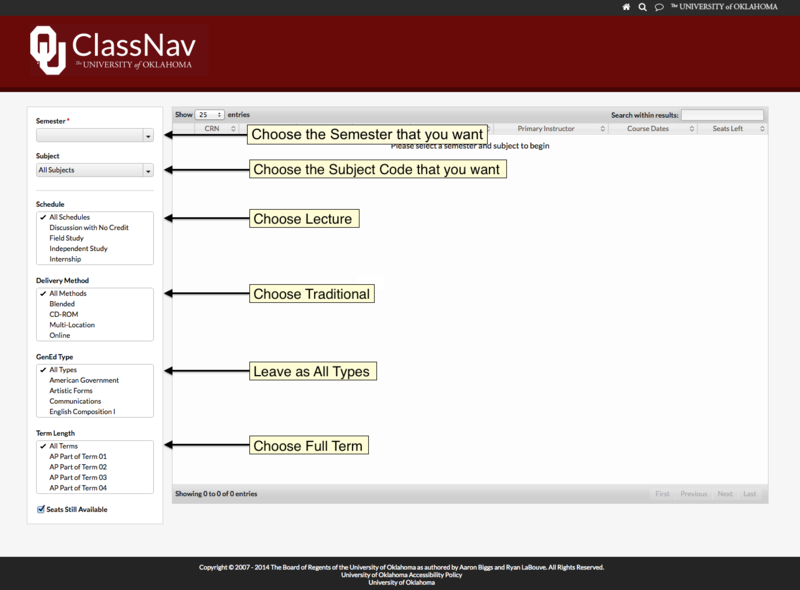 The Class Navigator website, classnav.ou.edu, is the simplest and most flexible tool to find courses each semester. Here is an instructional guide created to assist exchange students with the proper search parameters. When searching for potential coursework at the University of Oklahoma, exchange students should review enrollment requirements and restrictions as well as the prerequisite requirements for each course. Students will not be approved for advanced courses if they are missing too many requirements for successful participation in the OU course. All enrollment is managed through the Exchange Student Coordinator, who works with the appropriate departments, advisers, and faculty members to enroll students in their top choices. Students cannot self-enroll in courses. It is not recommended that students contact other campus officials directly, as this can delay the enrollment process. Every effort is made to accomodate exchange students, but OU cannot guarantee enrollment in coursework before arrival on campus. Exchange students must be flexible in their course preferences as course offerings can change, and enrollment in coursework at all levels is subject to the requirements in each academic department. All new students entering the University of Oklahoma for the first time must successfully complete the mandatory student online Sexual Misconduct Awareness training, also known as Title IX hold, at onpoint.ou.edu. Exchange students cannot be enrolled until this training is completed. Some courses have online waitlists, and some courses do not. Some courses allow students to enroll beyond the initial seat capacity, and some courses do not have this flexibility. If an exchange student wishes to enroll in a course that is already full, the student should contact the Exchange Student Coordinator. Exchange students may add and drop classes the first two weeks of the semester via the Exchange Student Coordinator. Any changes after the second week of classes must be approved by the Dean and are not guaranteed. Remember that exchange students must be enrolled in a minimum of 12 credits each term. It is important to use ClassNav to find courses taught in the correct term. Not all courses in the OU Course Catalog are taught every semester. Occasionally, course are cancelled due to low enrollment, but this is not common. Here is a list of the colleges and their departments at the University of Oklahoma. This is a full list for the university, so it is important to remember the restrictions for exchange students. As a condition of maintaining legal status in the U.S., federal regulations require international students participating in reciprocal exchange programs to engage “full time in a prescribed course of study” and to maintain “satisfactory advancement towards the completion of his or her academic program” (22 C.F.R. § 62.23(h((2)(i)). In order to comply with these regulations, an exchange student must be registered in a full-time credit load, be regularly attending and participating in classes, and be making a good faith effort to progress academically in his/her program. ISS will contact your professors to verify grades and progress in your classes. Failure to progress in your coursework could impact your future studies at the University of Oklahoma. A record of your grades is called a transcript. All transcripts are letter graded. They can be translated/equated by your home university according to their educational policies. The Family Educational Rights and Privacy Act (“FERPA”) affords students certain rights with respect to their education records. These rights can be found here: https://www.ou.edu/content/recordsandtranscripts/release_of_information.html. FERPA allows the disclosure of information contained within an exchange student’s education record, without consent of the student, to an exchange student’s home institution. Accordingly, at the end of each student’s exchange period, the Office of International Services will send, via courier mail, one copy of the exchange student’s OU official transcript to the exchange student’s home institution. Any and all other copies requested by the individual student will be sent via regular mail at their request only. Grades can be viewed online two weeks after finals by logging into the One website.